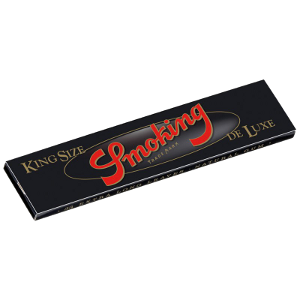 Rolling Paper Smoking De Luxe King Size. An ultrathin highly transparent rolling paper. With this slow burning Slim paper of 44 x 110 mm size, you will enjoy your smoke in style. 100% natural vegetable gum, with no colourings or other additives. Ahead of its time: one of the first ultra-fine rolling papers in many markets, and one of the most transparent. Rolling paper Smoking De Luxe King Size has "Natural gum" . Natural gum refers to the 100% natural Arabic gum used In the manufacturing of Smoking paper. No chemical colourings or other additives are used, and rigorous controls are in place that guarantee purity and cleanliness.